To get a Chakra Divination® Reading with Melissa click here. Chakra Divination® is an ancient method of intuitive evaluation, which is used to energize, balance and cleanse the seven major chakras. Even though it’s an ancient technique, it’s also new, unique and non-traditional when compared to conventional methods of chakra work. This method was given to me from the higher realms as a way to examine the chakras through the use of intuition to uncover problems, find a course of action and to obtain ultimate balance within each chakra. This benefits the person doing the reading on a spiritual level. The artwork and card meanings were also divinely guided. Chakra Divination® is a system you can use when your normal functioning energy flow feels disturbed. Through the use of the Chakra Divination® Cards, spreads and charts you can understand how to focus on the chakras using your intuition and perform intuitive chakra reading for yourself and others. 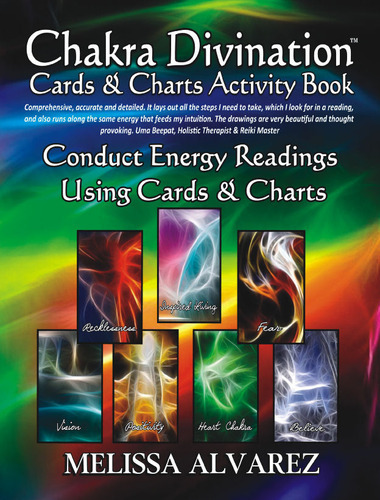 The Chakra Divination® Cards & Charts Activity Book is perfect for those who are like to take part in the creation of their own cards. The activity book includes a small font version of The Essential Guide To Chakra Divination®, all 82 Chakra Divination® Cards and the Chakra Divination® Charts. The activity book is printed in full vivid color. Because this is an activity book, you will take an active part in making the Chakra Divination® card deck your own by trimming the cards and charts out of the book, and at the same time, give them intention that is specific only to your soul’s energy, thereby connecting the cards and charts to you on a deep spiritual level. You also have the option of writing your own personal message to yourself on the back of the cards. It is recommended that you lightly laminate the pages after writing your messages on the back and prior to cutting out the cards to make them last forever. When you use the cards in a spread, your intuition during the drawing and laying of the cards will be more intense and accurate because you actually took an active role in the preparation of the card deck. Melissa may have designed the deck but you are making it your own through creation. While not a typical way to bring out a divination card deck, the Chakra Divination® Cards & Charts Activity Book will give you a one of a kind personalized deck to work with as you balance your chakras. This deck will be forever uniquely your own. The Essential Guide To Chakra Divination® contains five chapters including the card meanings and spreads. Learn the signs, symptoms and solutions that your chakras are out of balance, discover how to bring them back to center by using the Chakra Divination® Cards and and the basics of crystals and stones in chakra work. 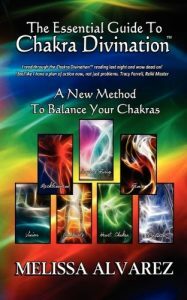 This book is the complete text as originally written for those who want a fuller understanding of chakras and how to work with them through Chakra Divination® to attain ultimate balance. This book is printed in a regular size font, unlike the text included in the Chakra Divination® Cards & Charts Activity Book. It is a great companion for those who want a smaller sized, easier to read book to carry with their deck. 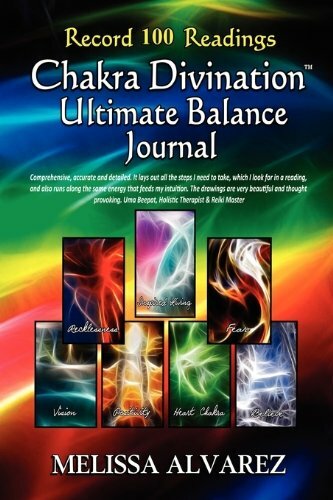 The Chakra Divination® Ultimate Balance Journal is a must have companion to the Chakra Divination® Cards and Essential Guide. With three months of journaling space, you will be able to write down your reading, make plans and record your progress in bringing balance to your chakra energy.